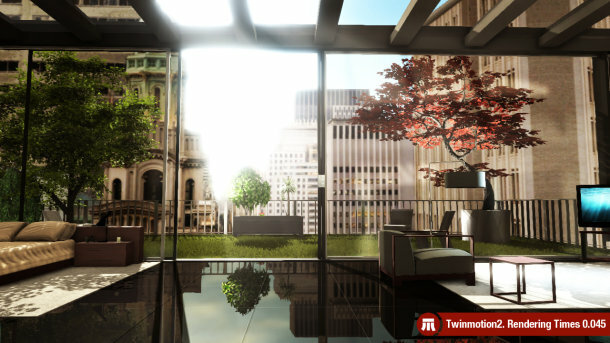 Developer Ka-Ra has unveiled full details of its Twinmotion 2 real-time rendering software. One of the most talked-about new products of the year, the company’s teaser blog – provocatively entitled ‘The Rendering Killer’ – attracted over 50,000 visitors in the run-up to the release. According to the blog, the software was developed with the help of leading firms such as Ateliers Jean Nouvel and Zaha Hadid Architects. It also comes complete with a user testimonial from Aéroports de Paris. As might be expected, the official feature list promises a range of powerful lighting and rendering options, including dynamic ambient occlusion, dynamic fog, God rays and simulated or physically accurate reflections. According to the product information, these functions are automatically linked to time of day, season and geographical co-ordinates. The software also includes basic modelling tools, including primitives and spline-based modelling; a materials editor; scene graph; timeline and location-based animation; and a range of post effects. Further toolsets add audio or interactive elements to scenes, including mouseover hotspots or interactions triggered by button presses. Twinmotion 2 also includes tools for creating simple animated water surfaces, and a rather more powerful-looking vegetation toolset, providing the option to paint plants onto a surface with a brush. The software has a recommended retail price of €2,420 ($2,990): around two to three times the price of non-real-time renderers like V-Ray and Maxwell Render, but rather less than StudioGPU’s MachStudio Pro. Following the experience acquired over the years, Twinmotion was developed to integrate the design and visualization process. Using revolutionary real-time technology, substantial time savings can be gained throughout the design process and savings of between 300% and 1500% can be realized in the creation of fullmotion video. Twinmotion®2 retails for $2990 for a single user license. Video: Is this the future of real-time rendering?